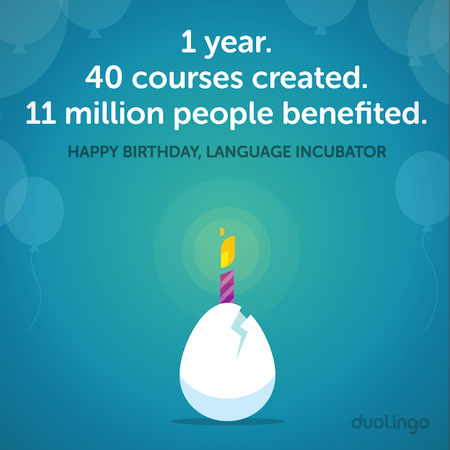 Today the Duolingo Incubator turns 1! Happy Incuversary! Exactly one year ago today, we launched the Duolingo Incubator. Inspired by the community's desire to help us further our mission of spreading free language education to the world we created a way for the community to build the courses they wanted to see on Duolingo. This year, over 40 new language courses have been created through your efforts, over 11 million language learners have gotten free access to education, and over 200 people have volunteered their time to build courses that may never have been offered on Duolingo otherwise. We've done this together because we believe that with better access to language education more people can achieve their dreams. A cheers to the entire community, and a special congratulations to all of the contributors and moderators who have volunteered their time. Yaay! I'm in there, with my old avatar. I don't have a girlfriend or a boyfriend, so I date Duolingo. Is it okay? Our relationship is going steady! I would also like to take this chance to say 'thank you' to Antonia, our first mentor, to Monica, our present mentor and to the entire Duolingo team. 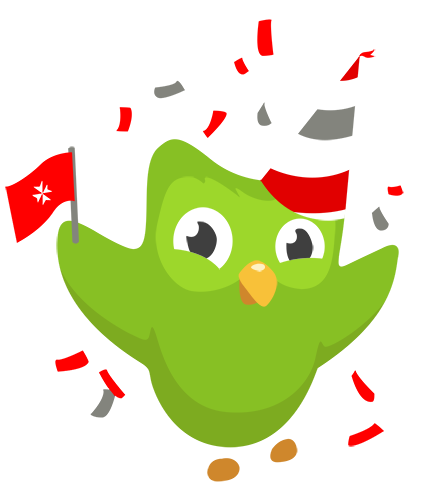 Wish you a lifelong, happy, prosperous relationship with Duolingo! Thank you, Jiten! You've been a reliable friend in the incubator! Happy INCUVERSARY! - С годовщиной! Congratulations and thank you for letting me be part of this project and giving us the ability to learn new/more languages! In that respect, my comparison doesn't really work right? Hm.. I know how excited I was about the incubator when it was first announced, and it turned our soooo great! So happy to be part of this amazing community! Congratulations Luis and team! You guys are totally awesome. I can't believe how quickly and how much incubator has evolved in only an year's time. Totally awesome! Thank you too, Duo team, for making all of this possible. Also thank you Duo community for the times you support and encourage us and make us feel our work is really needed and appreciated. Happy Incuversary to the Duo team, the contributors of all the courses and the whole Duo community. It's great to have been a part of this wonderful journey and having learnt so much from it. Learn Maltese! (you can see the other discussions at the bottom of the discussion). Smaller pictures please? I think they take too much discussion space... Maybe it's just me? They're only as wide as you can write. Yes, they are a bit big though, I'll go down one size. I knew u would post this StrapsOption! I knew I would too! If Maltese ever (hopefully) comes out on Duolingo I'm posting a post dedicated to u... cos ur Maltese's biggest fan! Nice one! Just one thing - normally we would say 'mhux problema', meaning 'it's not a problem'. 'Nru' does mean 'no', but it's very rarely used. Thank you so much for the opportunity to learn like this. It means so much to me and to many others around the world. Cool, thanks Duolingo. It's a pleasure working with you, most of the time. Thank you contributors for making these amazing courses! Merci Beaucoup! どうもありがとうございます! Vielen Dank! With Duolingo, and all the volunteers who make this project we only learn languages ​​free. Go walking year forward! 40 courses created, and more than 1 million beneficiaries! I started a hashtag on Google+. Happy #incuversary! 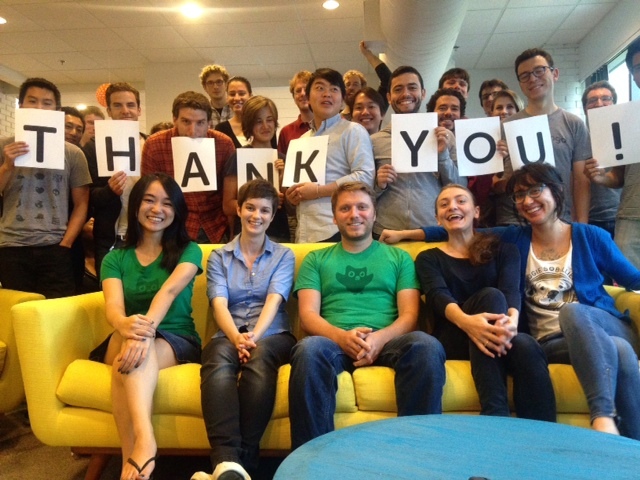 You want to show your thanks to the volunteers and duo users? I have an idea, and sorry if this sounds pretty critical, but can we get you guys back in the forums? With so many questions going unanswered and so little attention from the duolingo staff, I don't feel like I'm a valued member anymore. I feel like anything I have to say is viewed as irrelevant. Like all my thoughts and feelings have been replaced with your metrics and A/B testing. Happy birthday! :) <3 Thank you for all that you do. I want a green Duo shirt! Is there a way I can buy one? 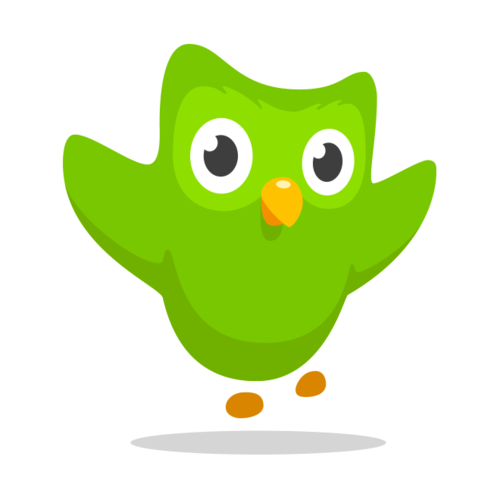 There were courses before the Incubator that were created by the Duolingo employees. The anniversary is for the Incubator. The incubator has enabled contributors to create 40+ more courses. The streaks longer than an year come from the learning with the original Duolingo courses. Felicidades a todos por este primer año de la incubadora! Solo es el inicio de esta gran iniciativa. Como entusiasta usuario de Doulingo, estoy ansioso de ver el desarrollo de otras ideas en Doulingo. Sigan con los éxitos!!! Happy Incuversary! Amazing work from you all - you are an inspiration. Thank you Luis, and a big thank you very much to the volunteers and the moderators. Without you, this would never have been the success it has. Thank you. Better late than never. Happy incuversary ! :) Thank you SourireCach. Can this please mean that the Swedish course gets released later today? Oh well. At least it's close. It is great that so many languages are becoming available, but is there any chance of sorting out the real problems in the current courses, particularly those caused by the new coach AB testing please? A response from the team would really be welcomed! Amazing work. Pretty soon we're all going to have to exercise an enormous amount of self-control to keep ourselves from studying ten languages at once. Will be a nice problem to have! 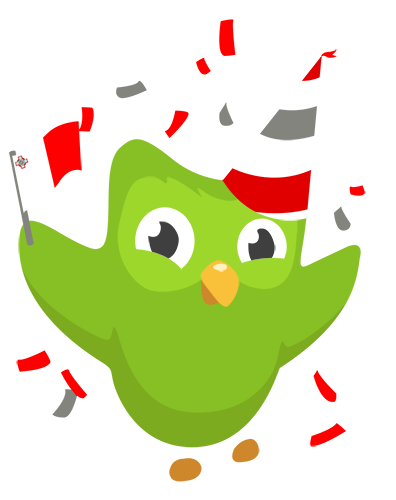 Happy New Year from Duolingo! Our Crunchie arrived at Duolingo HQ today! Today Is the Incubator's Birthday!